Fundraising Concert for Kolarаc Foundation was held on May 2 in Chicago. 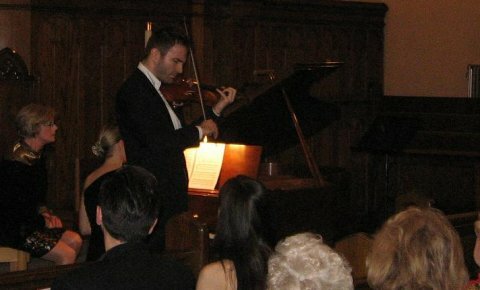 Renowned music artists Stefan Milenkovic - violin, Olga Bojovic - vocalist and pianist Kurt Wersterberg, Jasna Popovic, Renee Jakovčić, George Radosavljevic and Christian Civljak performed in front of a full hall of Saint Paul's Lutheran Church in Evanston,. The program, in addition to works by great artists of classical music, contained compositions by Natasha Bogojević, Serbian composer from Chicago. After the concert, the audience had the opportunity to meet the musicians. The great interest of the audience was especially the performance and meeting with Stefan Milenkovic. Video from the concert can be found here. Prior to the concert in Chicago, Kolarac Concerts were held in New York and Washington. It is expected that they will be organized in other cities of the United States (Boston, Miami, Los Angeles), as well as in European cities (London, Paris). The funds raised at the concerts will be used to purchase a new concert piano for Kolarac Concert Hall in Belgrade. Concert in Chicago was organized by the Consulate General of the Republic of Serbia, New Artists Management and Serbian-American Museum St. Sava. Consulate General of the Republic of Serbia wishes to thank the music artists, the audience and all those whose donations contributed to the success of this concert.